This post has been a long time coming. I have dreamt about writing this up for you for a while now and I finally got around to putting pen to paper, keys to screen 😉 Think of this as a graduation/start-of-summer/early birthday gift…for you! You know I love pancakes and you know I love you, so why not just celebrate all the good things in life? Pancakes have to happen every weekend here in the Pytell house-hold. Well, at least for me. People can get pretty intimidated by pancakes. I know my mom has always hated making them because they always burn. But she has never made my type of pancakes. I am pretty sure I have mastered the art of the single-serve, healthy, gluten-free, vegan, weekend pancake breakfast. Practice makes perfect right? Making them every weekend for months now, I think I have it down. No pancake flops here, although since I always like to try new crazy combos of flavors, flours, and the like, sometimes they may not taste as good as they can, but it is always remedied by that fact that, its pancakes, and chocolate sauce can always be involved 😉 But if you follow this simple outline, you will be addicted to making pancakes every weekend just like me! It is easy, healthy, and so much fun since the possibilities are endless! 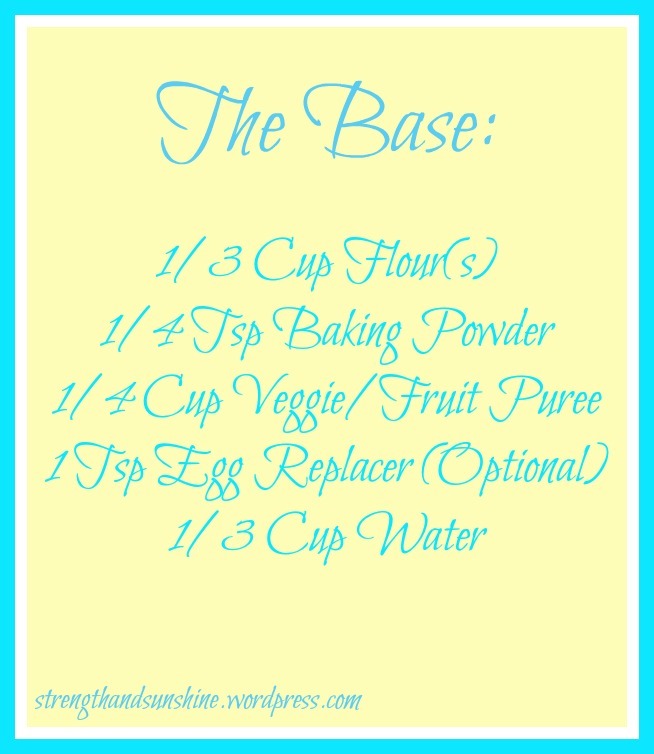 Here is you base recipe. You really just need flour, puree, and water. For the flour I like to mix it up with a few tablespoons of different things. I use at least 2 tablespoons of all-purpose no matter what, but for the rest I like to use buckwheat flour, cornmeal, millet flour, coconut flour, banana flour, brown rice flour, oat flour, quinoa flour. Basically anything you have will work! For the purees I use things like apple sauce, pumpkin, banana, squash, carrot, shredded zucchini, shredded beets (usually mixed with another puree). If I am using something shredded like zucchini, I always add the egg replacer for extra binding. This is where the magic happens. Here the options really are endless, so let you imagination run wild! I always add flavored stevias, extracts, and always cinnamon (always!). You can also use tea of instant coffee as your 1/3 cup of water, but sometimes I will just mix the instant coffee granules right in. Frozen blueberries are great to add in after you pour some batter on the pan! Anything goes here. Find a flavor combo and run with it all out! The last fun step in creating the ultimate pancakes? 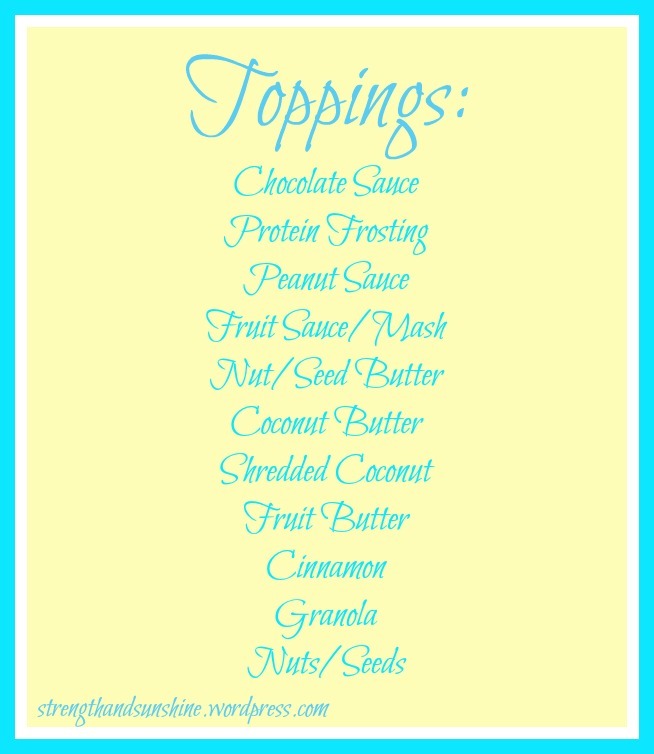 Toppings of course! For Chocolate or rather Cocoa Sauce, just mix 2 tablespoons of unsweetened cocoa powder with water and stevia. For protein frosting do the same as the cocoa. I like to mix cocoa powder and protein powder for mine! But I also love using a tablespoon of peanut flour with cocoa powder to make a peanutty chocolatey goodness. Depending on how much water you add will determine the consistency of you sauce. For more liquidy, add more water, for more of a frosting, add less 😉 The other options are pretty self-explanatory. 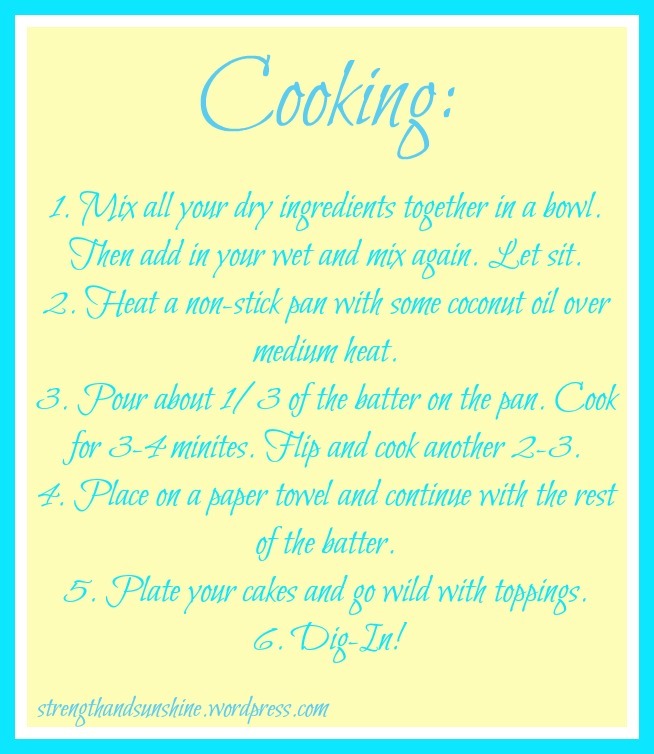 Follow these 6 steps for cooking your cakes and bon appetite! If you want to make a few batches and freeze for later you can do that too! Just place the cooked cakes on a wire rack and all to cool. Then wrap each cake in wax paper and place all the cakes for that serving in a plastic baggie! When you are ready to eat, just take them out and heat them either in the microwave or toaster oven! There you have it! You will be making pancakes all day everyday 😉 And if you want waffles use this same exact how-to and just use a waffle iron to cook! 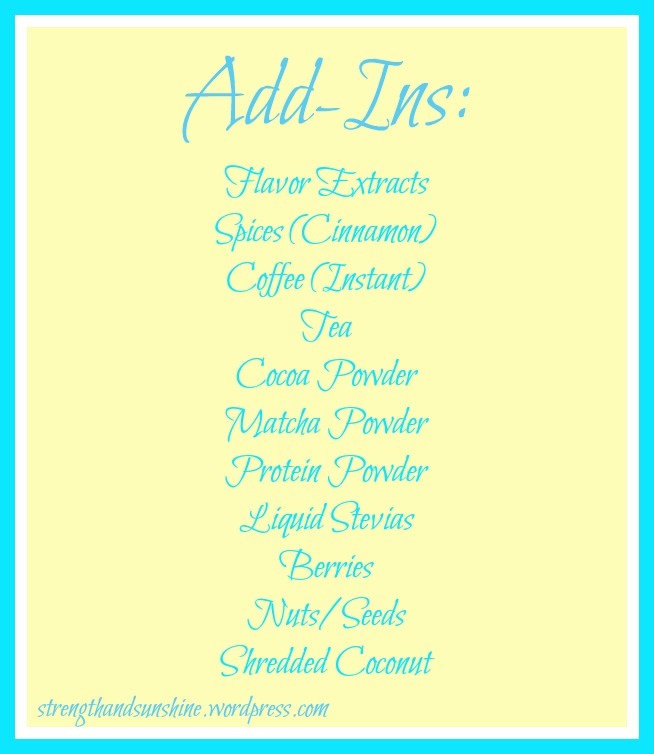 Crazy simple, easy, healthy, and customizable! Now when you see my Instagram feed over the weekend…full of pancake photos…you will know why. + Do you struggle with making perfect pancakes? 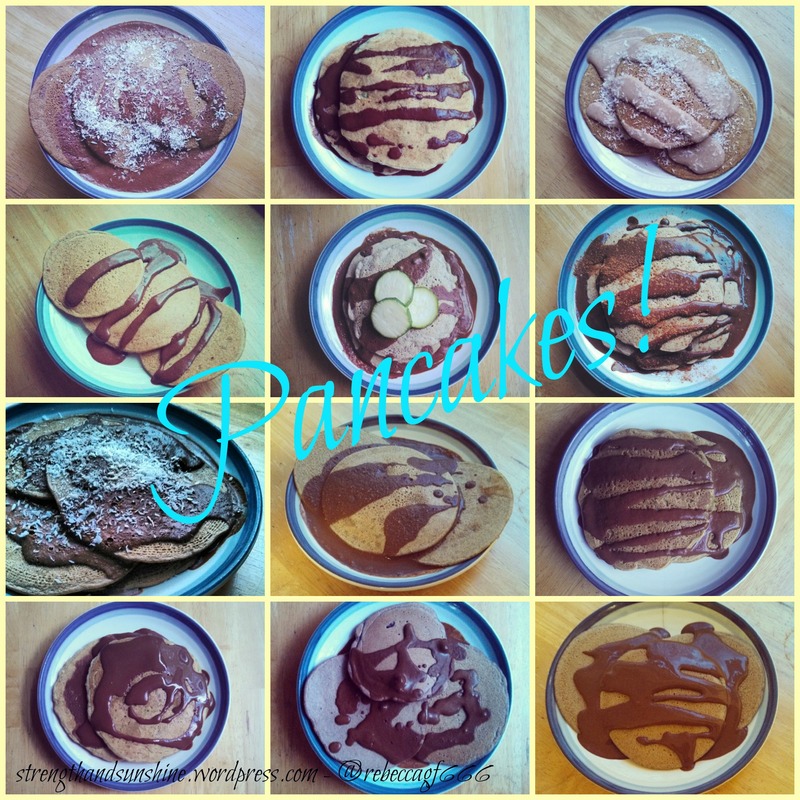 + What is your dream pancake recipe/combo? These look really good! With the husband deployed a lot, a recipe for one is perfect! I pinned this and will save it for easy to follow options when making pancakes. thanks for sharing on Real Food Fridays Blog hop! Thanks for posting this. I love pancakes, but have only made them myself once. The zucchini or beet pancakes sound lovely. Thanks Julie! I hope it helps ease your freezer capacity 😉 Haha! These look delicious! My indecisive nature is causing problems; they all look so good! Well there’s no recipe here just an outline haha! It sounds like you could have a different pancake every day of the week at your house! Thanks for linking up to #TastyTuesdays, I’ve pinned this onto the Tasty Tuesdays Pinterest board too. Yay for pancakes! I have a single portion recipe that’s very similar to yours – it makes it so much easier when you’re just cooking for yourself, or when you have a husband that wants a different flavour than you! Right! I am always only cooking for myself (at 6am!) and it definitely is the best way to go because everyone can have what flavors they want! This is awesome! I love single-serving pancakes, so this is just the post for me! 🙂 My favorite combo is pancakes (preferably whole wheat/vegan) topped with chopped apple, melty peanut butter, a drizzle of honey, and a sprinkle of cinnamon. Mmmmm. Single-Serve is always the way to go! so yummy! these look delicious! These look so yummy. The best pancakes I’ve ever had were cooked with raspberries and granola. Will have to try some of your chocolate sauce recipes!! Raspberries and chocolate are a wonderful pancake combo! You are making me want pancakes!! Yum!! Saving this for sure! 😀 Next time I want pancakes but the rest of the family doesn’t, I’m doing this. It is never a wrong time for a pancake! This is awesome! I love all the variation possibilities. I keep meaning to try more veggies in pancakes for my daughter- I am pretty sure she’d devour them! Thank you! 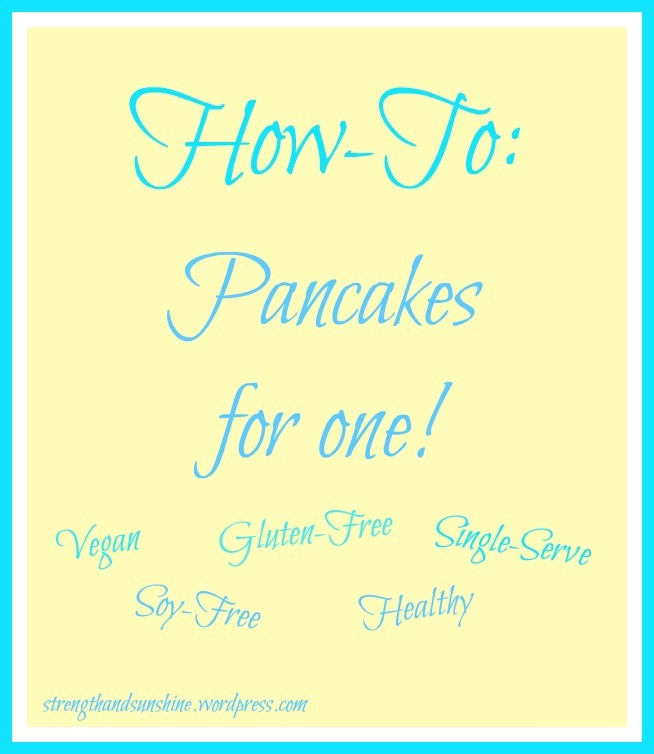 I’ve been looking for an easy vegan pancake recipe! Love this! Great post Rebecca! I actually make pancakes for one a lot…..if you count making four servings and having the leftovers once hahaha! I can eat a monster portion of pancakes, so I would need at least 2 servings to fill me up, but I love this that you have made it easier to make a new creation! Yum! Yea, I always load mine up and make them super filling! They are just the perfect breakfast no matter what you have the craving for! This is going to make me sound like a horrible foodie, but my favorite pancake recipe is when I use Bisquick Heart Smart! So good!! A pancake blueprint! I strawberry pancakes topped with sliced strawberries and vanilla protein frosting. Yum! Banana nut is probably my favorite pancake combo!